The inside cover of the CD is filled with pictures of people who have supported this project through kickstarter.com. These good-looking, generous friends are the ones who provided the finances and encouragement to make this album possible. It wouldn’t have happened without them. Greater Things- Why Did We Do It? What a crazy ride the past few months have been! For the past 3 years, Linda and I have been talking and praying about whether it was time to make a new album of worship songs. Finally, it became clear that we should do it; and the reason became clear. The two main questions we ask ourselves are “What is God saying?” and “How are we going to respond to that?” When we think about what we’re going to do and how it fits in to the life we feel called to live, we try to think and act within that paradigm. I’m 58 years old. I’ve been leading worship at the same church since 1984, and worked with the same senior pastor since 1974. We’ve felt called to stay in the San Francisco Bay Area, even when more lucrative offers came along. I’ve seen many worship leaders come and go, and have always felt like I could do more to encourage them and help them persevere when the hard times inevitably come. The older I get, the more I want to be part of encouraging and equipping the next generation that will lead the church, especially as worship is expressed. 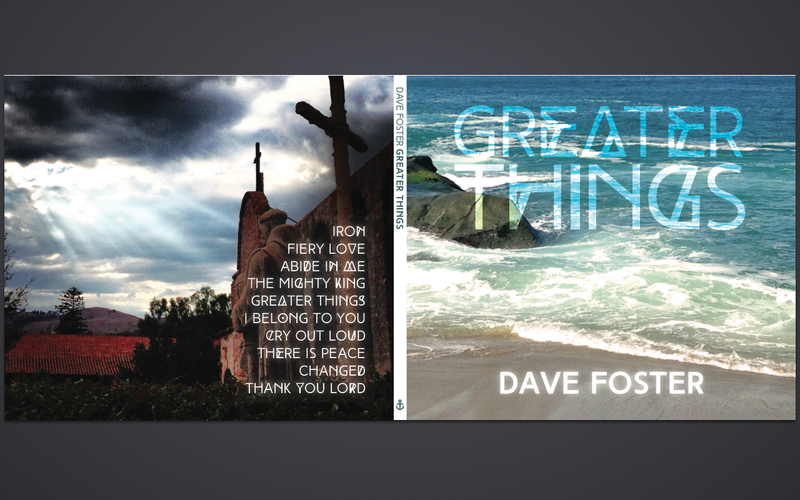 When we thought about naming the album project, Greater Things was always the only choice. It wasn’t that we thought any more of that song than the others, but the title said something prophetic about what we think God is leading us to do in the next season of life. If I have influence as a worship leader, I want to use it to help younger worship leaders and build the kind of character and leadership that will go the distance. I want them to do greater things than me. That’s how discipleship is supposed to work. It’s like apprenticeship. The apprentice eventually becomes a craftsman or craftswoman, and adds a new level of creativity, passion and skill. We have lived the songs on this album. They reflect the truth of our experience of following and worshipping God, right here. We’ve worshipped through seasons of pruning and fruit. Our fellowship and others around us have resonated with the words and music to express back to Him some of what He’s given to us. And it is my hope that they will find that same resonance in the wider church. Running a Kickstarter campaign and recording in Southern California wasn’t even a blip on our radar a year ago. In January, I was helping lead worship at a little church called The Well, in Nipomo, CA on a Saturday night. Matt Barker, who was drumming that night, gave me a copy of the CD their worship team had just made. I looked at it and noticed Marc Ford and Chris Lizotte had produced it for them. I liked the way it sounded and told Matt I was thinking about recording some songs soon. He suggested that I get hold of Chris and talk to him about it. So I did. In talking with Chris, I felt a natural rapport and knew we would work well together, that we had similar heart and vision in worship and music. We figured out a workable budget, and then I got going on planning a Kickstarter campaign. By this time it’s already mid-July! The recording was scheduled to start on August 20. Turns out Kickstarter is a pretty gut-wrenching experience. I’d set up the campaign to run 25 days, so I could give the studio plenty of time to fill their time, in case I had to cancel. Over the course of the first 17 days, we didn’t even reach 50% of the goal. I knew God had led me to this point, but it sure didn’t look as I had expected. It was stressful. The final 7 days, it all came together, and the album was fully funded! So now, a couple months later, the CD’s are here. We felt it was important to do the pictures of Kickstarter backers on the inside of the CD. We’ve enclosed a picture of the template we used because we weren’t aware some of the pictures would be cut off in the printing process. Each of you who have backed this project is a big part of this project. Your support and encouragement along the way has meant so much! Please enjoy Greater Things! We hope it fills your heart with worship, joy and inspiration to go on to Greater Things. Click to preview on iTunes.